Can't make either? Don't worry! We know how busy you are. Stay tuned for the launch of our latest toolkit for activists, which will share even more tools for taking action anytime, anywhere. - Kristin, Beth, Felicia, Gloria, Donna and the rest of the MomsRising team! MomsRising is sharing some of our favorite tactics and tips for advocacy and organizing! 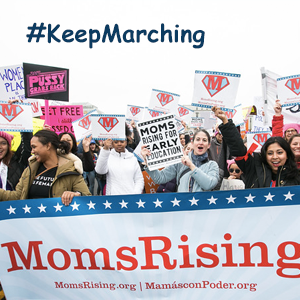 Sign up for MomsRising's #KeepMarching Telephone Town Hall Meeting now! After the Women’s March, women, mothers and others across the country vowed to #KeepMarching. And members like you are in fact still marching in many ways—by paying attention, speaking out and showing up, online AND on the ground. MomsRising sees our members joining together by the thousands, building up your voices and your power in defense of families, communities and our country. We could not be more proud, and we are with you every step of the way! That’s why, on Tuesday, February 21, at 9 PM EST, MomsRising is holding a Telephone Town Hall to share simple, easy-to-use tips about some of our favorite organizing and advocacy tactics with our members who are ready to do more. *RSVP now for the MomsRising Telephone Town Hall. This is how it will work: When you RSVP, you’ll tell us the best phone number where you can be reached. Then, we’ll call you at the scheduled time and plug you right in. You won't need to write down a phone number and dial in, you'll just pick up when you hear the phone ring at 9 PM EST! *CLICK HERE TO RSVP NOW. We can’t wait to have this Town Hall with you! Together, we’ll #KeepMarching for women’s rights and human rights, and for our families, our communities and our country.